The distribution of quartzite gravel, cobbles and boulders on the mountaintops, ridges plateaus and valleys of northwestern USA and southwest Canada presents a serious challenge to the uniformitarian paradigm. Such geologists have recognized the inadequacy of present day processes to explain these deposits. Of all the uniformitarian hypotheses proposed, the only one that does not seem to have been eliminated is the ‘outrageous’ hypothesis of large-scale fluvial transport. This hypothesis still falls far short of accounting for the geological evidence, including the extensive distribution of the quartzite deposits, the long distance of transport, the iron staining of the quartzite clasts and their abundant percussion marks. Figure 1. Proposed braidplain formed in a semi-arid environment up to 150 km east of the Rocky Mountains. Note that this braidplain spread over the incipient Sweetgrass Hills and Bears Paw Mountains of north central Montana. (From Leckie and Cheel,11 p. 1,928). Paleocurrent directions and a general decrease in clast size demonstrate that the quartzites were eroded from the northern Rocky Mountains. The quartzite material becomes well rounded the farther away they are from their source areas. Gravel deposits are found on mountaintops, ridges, plateaus and in valleys at lower elevations. They have been transported over 1,000 km to the east and 700 km to the west over what appears to have been generally flat ground. The quartzite gravels range in thickness from a thin lag to deposits up to 4,750 m in northeast Idaho and over 3,000 m east and northeast of Jackson Hole, Wyoming. There is a general size decrease in the gravel away from the sources. The quartzite gravel is often iron stained and commonly exhibits percussion marks. Thick deposits, occurring mainly in deep, likely fault-controlled valleys or basins, often have pressure solution marks and are fractured. Gold is sometimes found within the matrix of the gravels, for instance in central and northeast Oregon and northwest Wyoming. The observation and analysis of these quartzite gravels represents the culmination of a fifteen-year project. Yet, much remains to be learned from these and similar deposits. Figure 2. Sequence of events proposed for the origin of the Cypress Hills quartzite gravels. (a) Coarse quartzite debris shed eastward off the Rocky Mountains. (b) Granitic intrusive rocks uplifted previously deposited sediments. (c) Uplifted sediments recycled northeastward to their present location in the Cypress Hills followed by erosion of the whole area. (From Leckie and Cheel,11 p. 1,929). The inadequacy of river transport was also recognized by Leckie and Cheel.11 Instead, they proposed that multiple braided streams spread a large sheet of gravel 150 km out from the Rocky Mountains in a semi-arid climate, forming what is called a ‘braidplain’.12 Figure 1 shows their interpretation of this braidplain, which extended so far east as to cover the incipient Sweetgrass Hills and Bears Paw Mountains. Then the tectonic uplift of the Sweetgrass Hills and Bears Paw Mountains provided an ‘eastward boost’ to the gravel (figure 2). The boost was partially provided by rivers or streams in confining valleys. Subsequent erosion over about 30 million years produced isolated gravel-capped erosional remnants at four general levels. The transport of exotic quartzites 300 to 700 km from their nearest source over slopes of less than 0.1 degree. Figure 3. Schematic showing how we believe the percussion marks formed in the Cypress Hills gravel. 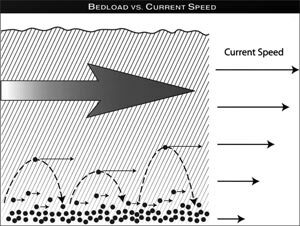 A current will carry bedload dragged along the bottom, smoothing the surface into a planation surface. If currents are fast enough, clasts will be briefly carried up into suspension within the current. As the clasts crashed down into the bedload, percussion marks were formed. Figure 4. 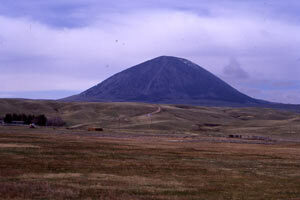 West Butte of Sweetgrass Hills, north-central Montana. Figure 5. 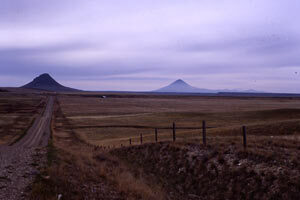 Haystack Butte (left) and Middle Butte (right) of the Sweetgrass Hills, north-central Montana. The quartzite gravels show no evidence of being deposited in channels or as alluvium. Transport by ‘palaeorivers’ would have eroded and incorporated a mixture (probably a majority) of local lithologies, but we observe that 90% or more of the gravels are quartzite. Based on the observations, the evidence overwhelmingly points to transport by a sheet flow of water. Flash floods and the break up of ice dams during the Ice Age can be eliminated.3 Furthermore, the Cypress Hills Formation cobbles and boulders were at first spread over an area much more extensive than the Cypress Hills.4 After deposition, the high plains continued to be eroded. Generally three more planation surfaces formed on the high plains with a total depth of erosion of 760 m down to the level of the rivers surrounding the Cypress Hills. This is the signature of sheet erosion by water that becomes more channelized with time. Klevberg used the Chezy Equation for coarse sediment bedload transport and the Keulegan Equation for bed roughness.13 From the fact that percussion marks are abundant in the gravels, Klevberg reasoned that the quartzites were in suspension briefly in fast turbulent flow. There is a relationship between the horizontal and fall velocity of suspended clasts that Klevberg used to calculate current velocities near the bottom of the flow. The maximum size and shape of the clast briefly suspended in turbulent flow was considered. A 15-cm wide bullet shaped clast was considered the maximum. The spin of the non-spherical clast was also considered in the calculation. The results showed that transport of the gravel in brief suspension would require transport by a current with a depth of at least 55 m and moving with a velocity of at least 108 km/h (figure 3 and table 1).3 While the data upon which these calculations are based provide considerable spread, resulting from the many differences in bed roughness, clast shape and other variables, it should be noted that the calculations provide minima for current parameters. The inferred velocity is several times faster than is typical of flash floods on earth that travel down steep mountain slopes. However, the spread of Cypflax was over a low slope and a large area. Table 1. Minimum flow velocity and depth for two thresholds and shapes of quartzite clasts. (After Klevberg and Oard3). The Sweetgrass Hills (figures 4 and 5) are 100 to 150 km from the Rocky Mountain front and are small crystalline rock intrusions, called stocks.20 It is hard to imagine that these isolated hills that range up to about 2,100 m ASL (above sea level) and up to 1,000 m above the plains could shift huge amounts of quartzite another 150 km northeast to form a sheet deposit of gravel on the Cypress Hills Plateau. How does the Leckie and Cheel hypothesis account for the Swift Current Creek, Wood Mountain Plateau and Flaxville Plateaus, a few hundred km farther east that are also capped by quartzite gravels? What about the quartzite gravels in North Dakota? There is very little quartzite gravel around the Sweetgrass Hills, although we found an isolated cobble above the depth of glaciation while climbing West Butte. The Bears Paw Mountains are about 200 km from the Rocky Mountain front to the east, farther than Leckie and Cheel’s12 150 km of transport in their initial braidplain. (It is possible that quartzite gravel could have originated from quartzite outcrops in the Little Belt and Big Belt Mountains to the south and south-southwest, which are closer than the Rocky Mountains, but the volume of quartzite in these mountains is limited and paleocurrent directions in the quartzite gravels indicate more of a westerly source). Furthermore, the quartzites that outcrop in the Rocky Mountains but east of the divide, especially south of Glacier National Park, are of lower grade (less metamorphosed) than the Cypflax gravel. Therefore, the Cypflax gravel likely originated west of the continental divide! This lower grade quartzite is generally what forms the non-Cypflax gravels south of the Cypflax exposures. Figure 6. Postulated area of the Targhee uplift, which coincides with the Snake River basalts laid down in a downwarp. (From Love,23 p. 4). ‘Immediately eliminated are the Paleozoic and Mesozoic rocks in mountains adjacent to Jackson Hole. The Flathead (Cambrian) and Tensleep (Pennsylvanian) Sandstones and the Quadrant (Pennsylvanian) Formation are the only ones in the Paleozoic sequence that are even moderately quartzitic, and this only in localized areas. These sandstones do not resemble, in physical appearance, variety of colour or degree of metamorphism, the quartzites in the conglomerates. No widespread quartzitic sandstones of consequence are in the Mesozoic sequence. The elimination of the above mechanisms leaves only the fourth mechanism: transport by rivers and/or alluvial fans from the west. This mechanism seems to be the only hypothesis currently entertained by uniformitarian scientists.27 Before we discuss this idea, we must know the source and distance of transport of the quartzite gravels and conglomerates. It has been admitted by all investigators that the nearest source of the quartzites is in central Idaho along the eastern flank of the Idaho Batholith (figure 7) about 200 to 350 km from the Jackson, Wyoming area.34–36 The quartzite gravels are similar to the Belt Supergroup quartzites that outcrop in central and northern Idaho.37 We think it likely that the quartzites could have come from the unroofing of the Idaho Batholith and the erosion of the Belt Supergroup in the area. Lindsey thought that the farthest transport could have been up to 450 km away to the west or northwest.38 For the quartzites farther east in the western Bighorn Basin, Kraus believes these gravels were deposited in a ‘braidplain’, eroded from the quartzites in the Jackson area, 100 km to the west.28,29 But the quartzites also extend into the eastern Bighorn Basin, another 50 km east. Therefore, the total distance of transport ranges from 350 to 600 km! Recently, Janecke et al. have postulated that gravel transport from west of Salmon, Idaho, was by two large ‘Eocene’ paleorivers.27 These two paleorivers merged in southwest Montana and spread quartzites east and southeastward, forming what they call the Beaverhead-Harebell-Pinyon megafan that stretches from southwest Montana and adjacent Idaho into northwest Wyoming (figure 8). The paleovalleys are mainly defined by the outcrops of quartzite, some of which are on or near mountain ridges. Figure 9 shows a large distinctive quartzite boulder just west of Lemhi Pass, which is along the continental divide and is one of Janecke et al.’s paleovalley locations.27 Uniformitarian scientists believe these ridge top gravels were tectonically uplifted after deposition in the paleoriver. These paleorivers are supposed to have transported several thousand cubic km of quartzite into northwest Wyoming from 200 to 350 km away! We examined a number of outcrop locations mentioned by Janecke et al.27 and found quartzite boulders up to almost 1 m in length. We also noted fewer rounded quartzites to the west, as would be expected if the source is generally west of Salmon, Idaho. We observed well-rounded quartzite gravel in several locations south and west of the postulated paleovalleys near and south of the Morgan Creek/Panther Creek divide, around 50 km southwest of Salmon, Idaho. Some of these quartzite gravels were reworked by local mountain glaciers during the Ice Age. One outcrop of boulders was in the headwaters of Morgan Creek about 30 km north of Challis, Idaho. The largest boulder at this locale was about 0.7 m in diameter, and some boulders had percussion marks (figure 10), a sign of very fast, turbulent flow. Therefore, the idea of two paleovalleys funnelling quartzites eastward is a simplification. Figure 8. Postulated paleovalleys from near Salmon, Idaho, into southwest Montana forming the ‘Beaverhead-Harebell-Pinyon megafan’ that spread thick quartzite gravels into northwest Wyoming. (From Janecke et al.,27 p. 439). The limestone conglomerate probably represents catastrophic local erosion as the mountains of southwest Montana and east-central Idaho rose upward. This is deduced from the abundance of angular clasts. Water was also involved since some of the clasts are rounded. One would certainly expect that there would be plenty of limestone clasts and limestone conglomerate mixed with the quartzites if these quartzite gravels were spread east by rivers. Could it be that the currents that eroded the quartzite from near the Idaho batholith were so fast that the limestone was rapidly pulverized? Can rivers really transport large quartzites from central Idaho to east of Jackson Hole, not to speak of the Bighorn Basin farther east? Janecke et al. do not provide any quantitative evaluation of their paleovalley hypothesis.27 Their paper simply tries to trace out, based on the location of the quartzite gravels, the supposed routes of transport. Furthermore, we would expect that ‘paleorivers’ would have eroded and incorporated the local lithologies, but the clasts are more than 90% quartzite. 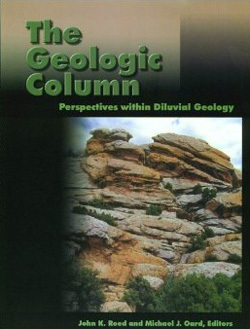 To provide the gravitational potential energy for transport by ancient rivers for quartzite gravels up to 25 cm in diameter, Lindsey calculated the height of the mountains in central Idaho as ranging up to 4,500 m above the level of the quartzites in northwest Wyoming with a 1° slope, his minimum slope estimate.26 Since the Jackson, Wyoming area is around 1,800 m ASL, the mountains in central Idaho would have to have been 6,300 m ASL. This scenario is of doubtful validity, even for the lowest postulated slope by Lindsey.26 There are many large boulders greater than 25 cm in diameter and there is little elevation difference between the source of the quartzites and the current locations of the quartzite gravels. The gravels in northwest Wyoming probably are of higher elevation. There would have to have been tectonic subsidence of the northern and central Rockies following the paleovalley river transport for the mechanism to be viable. Figure 9. 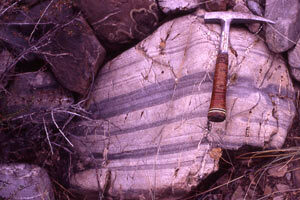 Large blue-banded quartzite from just west of Lemhi Pass, which is on the continental divide. This location is one of the paleovalley locations of Janecke et al.27 Note that the boulder is subrounded, since it is closer to the source. The only hypothesis that has been entertained for the spread of quartzite gravels west of their Rocky Mountain source is transport by rivers.41,42 Researchers correctly deduced that the quartzites originated from the Belt Supergroup. The rivers are referred to as the ‘ancestral’ Columbia, Salmon and Clearwater Rivers. The Salmon and Clearwater Rivers flow westward through central Idaho. The Salmon River flows into the Snake River south of Lewiston, Idaho, while the Clearwater River flows into the Snake River at Lewiston. The uniformitarians themselves recognise the problems associated with the sheer scale of the distribution of quartzites either side of the Rocky Mountains. We now turn our attention to northern and central Oregon. 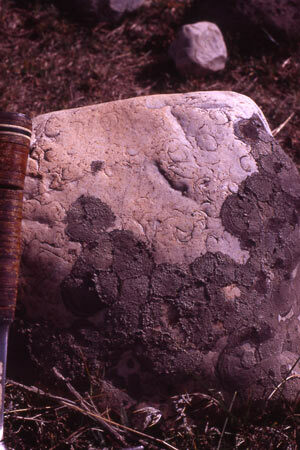 Allen51 and others noted at least eight locations of well-rounded quartzite boulders with abundant percussion marks on top of the Wallowa Mountains, northeast Oregon, from 1,402 to 2,658 m ASL. The boulders are up to 1 m in diameter southeast of Lookout Mountain, and Jim White Ridge is covered by a 55-m thick layer of quartzite boulders up to 60 cm in diameter, covering an area of about 3 km2. Placer gold exists in the quartzite gravels and an active mine once existed on Jim White Ridge. Allen first discovered these gravels in 1938 but published little on the subject until 1991 because they puzzled him. He suggested that the gravels with gold in the matrix were not laid down by some lazy meandering stream flowing from the east or southeast, but by a northwest flowing ‘torrential paleoriver’ in a broad valley with a braided channel (figure 12).51 The question is what paleoriver? The river apparently is not the ancestral Columbia or Snake Rivers.52 (We suppose that the uniformitarian geologists can claim the quartzite gravels were spread by the ancestral Clearwater or Salmon Rivers, when the Snake River supposedly flowed through southeast Oregon and before the Snake cut the deepest water gap in North America at Hells Canyon. 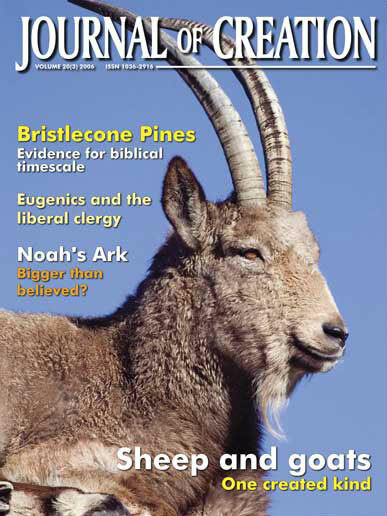 There is little if any evidence for the existence of a paleo-Snake River through Oregon.53,54) Allen admits that his deduction is ‘an outrageous hypothesis’, but it is the best he can do, and he published the information in 1991 to stimulate further research. Figure 11. The supposed course of the ‘ancestral’ Columbia River along the edge of the Columbia River basalts. The path through the southwest Columbia River Basalt Group based on the deposited quartzite gravels from Sentinel Gap southwest to Hood River, Oregon. (From Fecht et al.,42 p. 226). Figure 12. Schematic of a wide northwesterly flowing, braided stream through the northwest part of the Wallowa Mountains in early Miocene time according to Allen.59 Stipples indicate walls of valley and x marks locations where quartzite gravels are found high up in the Wallowa Mountains. Periodic torrential flow spreads the quartzites farther and farther northwest. The nearest source of quartzite outcrops is in central Idaho, about 200 km to the east, but across Hells Canyon. Our research has revealed other quartzite gravel locations several km west of those that Allen cites. There are even more in northeast Oregon that we have not seen but are briefly mentioned in the literature.55,56 Their presence in more locations spells an even more widespread distribution than Allen mentions and makes his broad paleovalley hypothesis even more outrageous. We believe Allen was on the right track in deducing a paleotorrent in a wide channel,51 but the quartzites are too extensive to provide a hypothesis for just river transport in the area of the Wallowa Mountains before they rose. The quartzite locations in central Oregon on top of Gold Hill and east of Paulina are especially difficult to place within the confines of some ‘ancestral river’. They are well southwest of the supposed paths of the ancestral Clearwater or Salmon Rivers. There is no evidence in the geology of central or eastern Oregon to suggest an ancient river. The uniformitarians themselves recognise the problems associated with the sheer scale of the distribution of quartzites either side of the Rocky Mountains.51 The main uniformitarian hypothesis seems to be fluvial transport, but this hypothesis falls far short of accounting for the long distance of transport, the iron staining and percussion marks.3 Other previous explanations offered for the eastward transport of quartzites, such as transport by tectonic uplift in eastern Idaho and transport on thrust sheets that have moved east for a long distance have been discarded by uniformitarians. None others were offered for long distance transport east of the source. The major problem with the uniformitarian explanations of the quartzites is that they do not have access to geological processes that have sufficient power to explain the extent and thickness of the quartzite deposits and the massive scale water volume and velocity that must inevitably go with it. The failure of these points amounts to a failure of the interpretive framework, and the need for one that has sufficient power to explain the data. We believe, however, that the quartzite gravels represent strong evidence for the Recessive Stage of the Flood with its two phases of sheet flow followed by channelized flow.57 In the final paper of this series,58 we explore a diluvial interpretation of these quartzites within the context of the Recessive Stage of the Flood, and show how it explains the evidence in an elegant way. Oard, M., Hergenrather, J. and Klevberg, P., Flood transported quartzites east of the Rocky Mountains, Journal of Creation 19(3):76–90, 2005. Return to text. Oard, M., Hergenrather, J. and Klevberg, P., Flood transported quartzites: Part 2 west of the Rocky Mountains, Journal of Creation 20(2):71–81, 2006. Return to text. Klevberg, P. and Oard, M.J., Paleohydrology of the Cypress Hills Formation and Flaxville gravel; in, Walsh, R.E. (Ed. ), Proceedings of the Fourth International Conference on Creationism, Technical Symposium Sessions, Creation Science Fellowship, Pittsburgh, Pennsylvania, pp. 361–378, 1998 Return to text. Oard, M.J. and Klevberg, P., A diluvial interpretation of the Cypress Hills Formation, Flaxville gravel, and related deposits; in, Walsh, R.E. (Ed. ), Proceedings of the Fourth International Conference on Creationism, Technical Symposium Sessions, Creation Science Fellowship, Pittsburgh, Pennsylvania, pp. 421–436, 1998. Return to text. Oard, M.J., The Lake Missoula Flood Controversy and the Genesis Flood, Creation Research Society Monograph No.13, Chino Valley, Arizona, pp. 78–84, 2004. Return to text. Vonhof, J.A., The Cypress Hills Formation and Its Reworked Deposits in Southwestern Saskatchewan; in, Alberta Society of Petroleum Geologists 15th Annual Field Conference Guidebook, Part I, pp. 142–161, 1965. Return to text. Leckie, D.A. and Cheel, R.J., The Cypress Hills Formation (upper Eocene to Miocene): a semi-arid braidplain deposit resulting from intrusive uplift, Canadian Journal of Earth Sciences 26, p. 1919, 1989. Return to text. Leckie and Cheel, ref. 11, pp. 1918–1931. Return to text. Klevberg and Oard, ref. 3, pp. 362–371. Return to text. Klaucke, I., Masson, D.G., Kenyon, N.H. and Gardner, J.V., Sedimentary processes of the lower Monterey Fan channel and channel-mouth lobe, Marine Geology 206:181–198, 2004. Return to text. Mulder, T. and Alexander, J., The physical character of subaqueous sedimentary density flows and their deposits, Sedimentology 48:269–299, 2001. Return to text. Shanmugam, G., High-density turbidity currents: Are they sandy debris flows? Journal of Sedimentary Research 66:2–10, 1996. Return to text. Shanmugam, G., The Bouma sequence and the turbidite mind set, Earth-Science Reviews 42:201–229, 1997. Return to text. Shanmugam, G., 50 years of the turbidite paradigm (1950s–1990s): Deep-water processes and facies models—A critical perspective, Marine and Petroleum Geology 17:285–342, 2000. Return to text. Shanmugam, ref. 18, p. 301. Return to text. Lopez, D.A., Geology of the Sweet Grass Hills North-Central Montana, Montana Bureau of Mines and Geology Memoir 68, Butte, Montana, 1995. Return to text. Leckie and Cheel, ref. 11, p. 1918. Return to text. Lindsey, D.A., Sedimentary petrology and paleocurrents of the Harebell Formation, Pinyon Conglomerate, and Associated Coarse Clastic Deposits, Northwestern Wyoming, U.S. Geological Survey Professional Paper 734-B, U.S. Government Printing Office, Washington, D.C., pp. B62–B65, 1972. Return to text. Love, J.D., Harebell Formation (Upper Cretaceous) and Pinyon Conglomerate (Uppermost Cretaceous and Paleocene), Northwestern Wyoming, U.S. Geological Survey Professional Paper 734-A, U.S. Government Printing Office, Washington, D.C., 1973. Return to text. Schmitt, J.G. and Steidtmann, J.R., Interior ramp-supported uplifts: implications for sediment provenance in foreland basins, Geological Society of American Bulletin 102:494–501, 1990. Return to text. Lawton, T.F., Boyer, S.E. and Schmitt, J.G., Influence of inherited taper on structural variability and conglomerate distribution, Cordilleran fold and thrust belt, western United States, Geology 22:339–342, 1994. Return to text. Lindsey, ref. 22, pp. B1–B68. Return to text. Kraus, M.J., Sedimentology and tectonic setting of early Tertiary quartzite conglomerates, northwest Wyoming; in: koster, E.H. and Steel, R.J. (Eds. ), Sedimentology of Gravels and Conglomerates, Canadian Society of Petroleum Geologists Memoir 10, Calgary, Alberta, Canada, pp. 203–216, 1984. Return to text. Kraus, M.J., Early Tertiary quartzite conglomerates of the Bighorn Basin and their significance for paleogeographic reconstruction of Northwest Wyoming; in, Flores, R.M. and Kaplan, S.S. (Eds. ), Cenozoic Paleogeography of West–Central United States, Rocky Mountain Section of S.E.P.M., Denver, CO, pp. 71–91, 1985. Return to text. Lindsey, ref. 22, p. B64. Return to text. Ryder, R.T., Lithosomes in the Beaverhead Formation, Montana-Idaho: a preliminary report; in, Henderson, L.B. (Ed. ), Montana Geological Society Guidebook: 18th Annual Field Conference August 9–12, 1967—Centennial Basin of Southwest Montana, Montana Geological Society, p. 69, 1967. Return to text. Love, ref. 23, p. A29. Return to text. Janecke et al., ref. 27, p. 442. Return to text. Ryder, R.T. and Scholten, R., Syntectonic conglomerates in Southwestern Montana: their nature, origin and tectonic significance (with an updated); in, Peterson, J.A. (ed. ), American Association of Petroleum Geologists Memoir 41, Tulsa, OK, pp. 131–157, 1986. Return to text. Janecke et al., ref. 27, p. 439. Return to text. Lindsey, ref. 22, p. B62. Return to text. Lindsey, ref. 22, pp. B62–B63. Return to text. Ryder, ref. 31, pp. 69–70. Return to text. Fecht, K.R., Reidel, S.P. and Tallman, A.M., Paleodrainage of the Columbia River on the Columbia Plateau of Washington state: A summary, RHO-BW-SA-318p, Rockwell Hanford Operations, U.S. Department of Energy, Richland, Washington, 1985. Return to text. Fecht, K.R., Reidel, S.P. and Tallman, A.M., Paleodrainage of the Columbia River system of the Columbia Plateau of Washington state; A summary. Washington Division of Geology and Earth Researches Bulletin 77, 1987. Return to text. 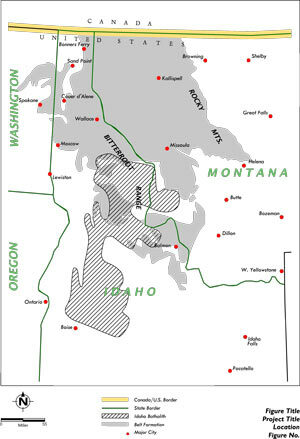 Warren, C.R., The Hood River conglomerate in Washington, American Journal of Science 239:106–127, 1941. Return to text. Warren, C.R., Course of the Columbia River in southern central Washington, American Journal of Science 239:209–232, 1941. Return to text. Rigby, J.G. and Othberg, K., Reconnaissance surficial geologic mapping of the Late Cenozoic sediments of the Columbia Basin, Washington, Washington Department of Natural Resources, Division of Geology and Earth Resources Open File Report 79-3, Olympia, WA, pp. 13–15, 1979. Return to text. Smith, G.A., Neogene synvolcanic and syntectonic sedimentation in central Washington, Geological Society of America Bulletin 100:1489, 1988. Return to text. Fecht, Reidel and Tallman, ref. 41, p. 34. Return to text. Warren, ref. 43, p. 115. Return to text. Waters, A.C., Geomorphology of south-central Washington, illustrated by the Yakima east quadrangle, Geological Society of America Bulletin 66:681–683, 1955. Return to text. Bretz, J.H., The Satsop Formation of Oregon and Washington, Journal of Geology 25:446–458, 1917. Return to text. Allen, ref. 51, p. 106. Return to text. Livingston, D.C., Certain topographic features of Northeastern Oregon and their relation to faulting, Journal of Geology 36:707–708, 1928. Return to text. Wheeler, H.E. and Cook, E.F., Structural and stratigraphic significance of the Snake River capture, Idaho-Oregon, Journal of Geology 62:525–536, 1954. Return to text. Allen, ref. 51, p. 107. Return to text. Carson, R.J., Where the Rockies meet the Columbia Plateau: geologic field trip from the Walla Walla Valley to the Wallowa Mountains, Oregon, Oregon Geology 63(1):25, 2001. Return to text. Oard, M., Hergenrather, J. and Klevberg, P., Flood transported quartzites: Part 4 a diluvial interpretation, Journal of Creation 21(1):61, 2007. Return to text. Allen, ref. 51, p.106. Return to text.